1. In a heavy-based saucepan, gently bring the milk and cream to the boil with the vanilla pod, then remove from the heat and leave to infuse for 15 minutes. 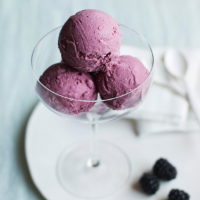 Lightly mash 600g blackberries in a bowl with 2 tbsp of the caster sugar; set aside. 2. Whisk the egg yolks and remaining sugar in a large bowl until thick and pale yellow. Remove the vanilla pod from the milk and cream, scrape the seeds back in and gently bring back to the boil. Whisk into the beaten egg yolks and sugar until fully combined. 3. Return the custard to the cleaned pan and place over a medium-low heat, stirring constantly, until it thickens and coats the back of a spoon, about 10-15 minutes Transfer to a bowl to cool completely. 4. Purée the macerated blackberries in a food processor until smooth and then push through a sieve, extracting as much liquid as possible; discard the seeds. Fold into the cooled custard with the lemon juice and salt until combined.